Intel's Core i9 chips won't hit the market for a few more months, but that hasn't stopped Polish site PCLab from putting the new 32-nanometer processor through its paces in a recent series of benchmark tests. While testing the pre-release 2.8 GHz Gulftown chip, PCLab found a significant speed increase with certain applications. According to their report, certain resource-intensive tasks, such as editing video or 3D modelling, perform up to 50% faster than Intel's current Core i7 chip. 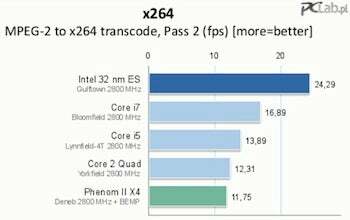 Unfortunately, the chip didn't shine in all areas; its performance is similar to that of older Core i7 chips when handling less demanding general activities. However, the Core i9 CPUs fared well when it came to power usage, using less power and running cooler compared to older chips. These results, which you can read in full here, could change before the Core i9's release in the first quarter of next year, so watch this space.